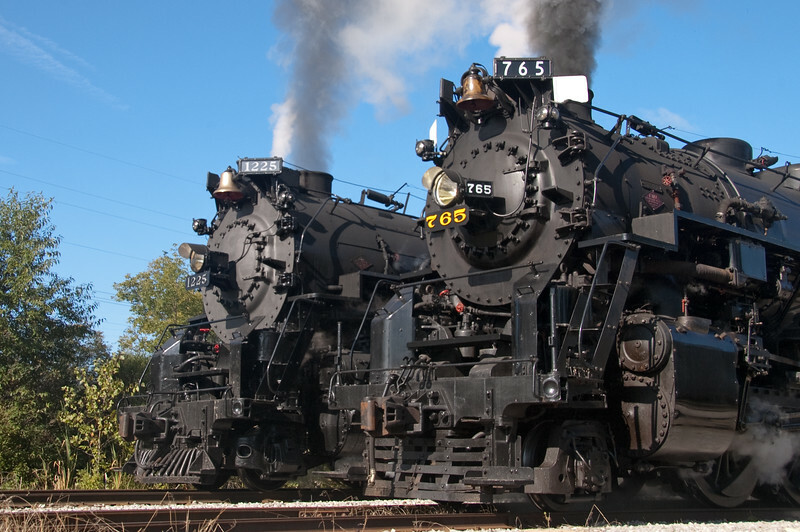 The similarities between Pere Marquette 1225 and Nickel Plate 765 are obvious. Both were cut from the same cloth as they were both acquired from the Lima Locomotive Works when the two railroads were under the common ownership of the Van Swerigen brothers of Cleveland, OH. The most notable difference in the appearance of the front ends of these locomotives is the pilots. The 1225 has a traditional vertical boiler tube pilot while the 765 has the standard Nickel Plate horizontal slat pilot. This photo was taken at the yards in Owosso, MI during a visit by Fort Wayne-based 765.